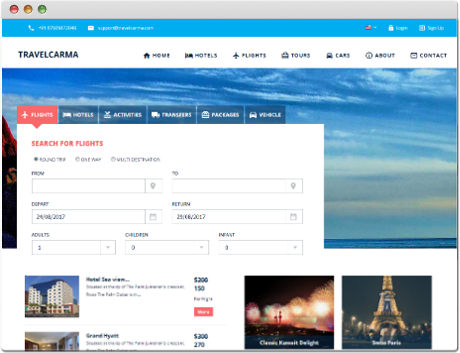 TravelCarma's web-based Travel Agency Software helps travel agencies maximize their online bookings while reducing their administrative costs. You can sell your travel products via multiple channels(B2C, B2B and B2B2C) and efficiently manage your operations through our advanced back-office automation system. We offer easy-to-use CMS-based portals which allow you to update your site's content without any technical assistance, reducing your business costs. Our portals are SEO friendly with all the features you'll see in a global OTA. When your customers are multilingual, why not have your website communicate with them in their language! Our system supports all the major languages including Chinese, Arabic, French, Spanish and more. You can easily add supplier content including data and images, as well as general content such as destinations, packages, hot deals, newsletter sign-up form and much more. Our portals come with responsive designs that work equally well on desktops,mobiles and tablets. Responsive design gives your users a seamless experience across all devices and reduces your maintenance costs too. 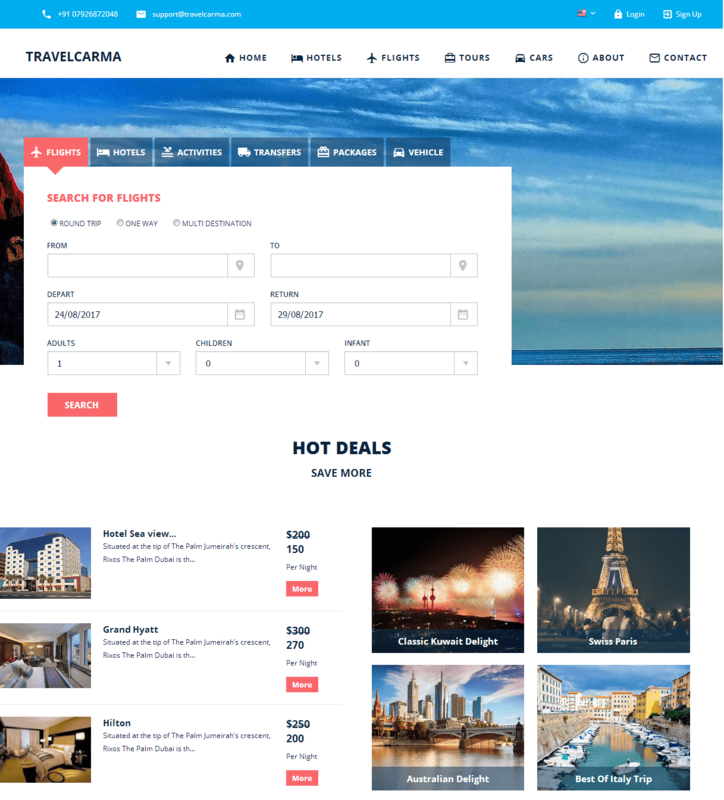 TravelCarma offers a complete set of B2C/B2B Booking Engines for flights, hotels, packages, activities and transfers. 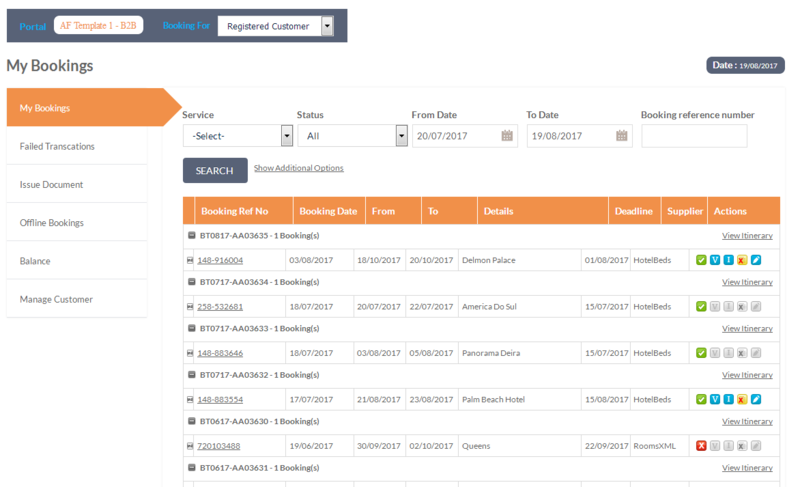 Our Booking Engines can be easily integrated with any third-party supplier(s) of your choice as well as your directly contracted inventory. 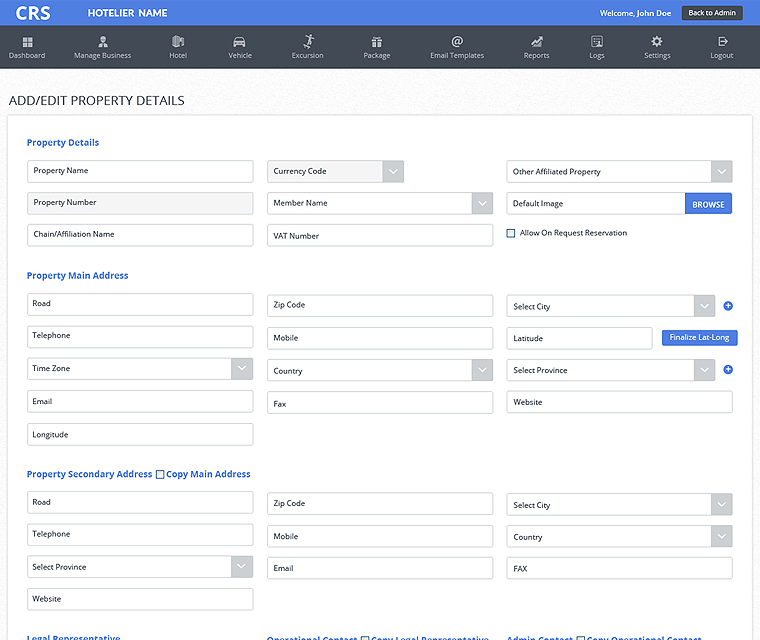 Our Booking Engines can be easily integrated with multiple suppliers (GDS, Wholesalers, etc) as well as your own contracted inventory allowing you to sell inventory from multiple suppliers sources simultaneously. 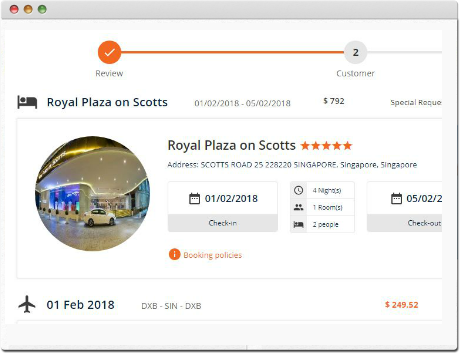 Our booking engines let you buy your inventories in different currencies, converts their rates into the currency of your market, applies real-time currency conversion factors and then lets you sell them in the local currency without worrying about market volatility. 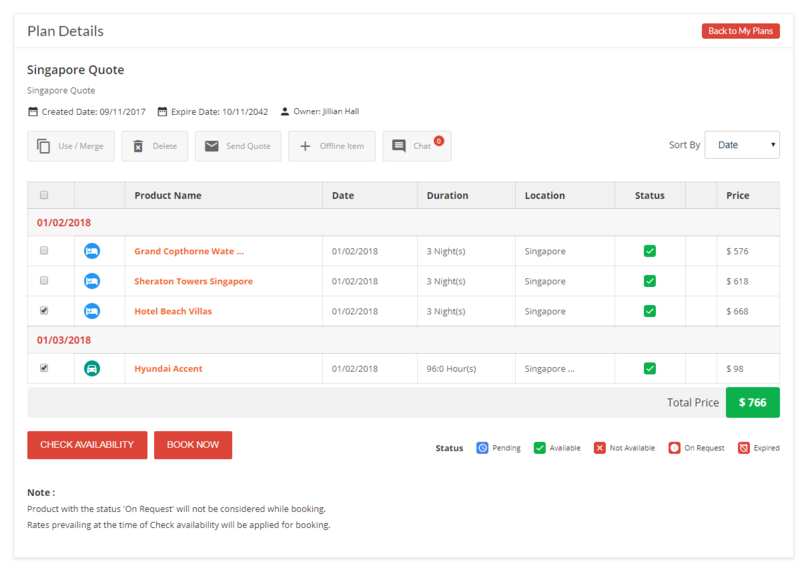 Track every booking made on your system through a single screen. 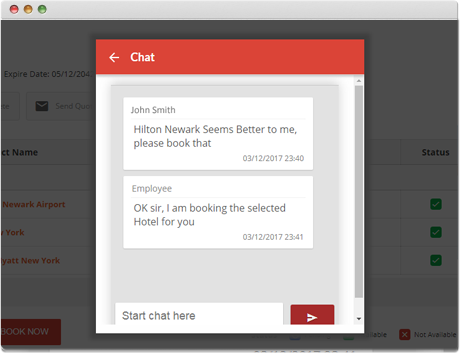 Your Employees/Agents can manage offline cancellation and modification requests. The system’s advanced intelligence will always keep you updated with failed transactions and their causes. 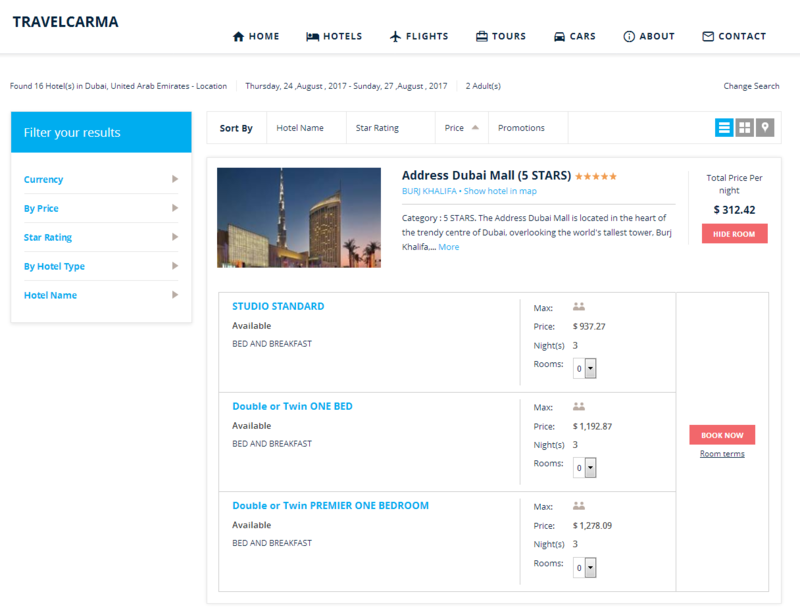 TravelCarma allows travel agencies to connect to multiple suppliers at once, including all major GDSs as well as top Hotels, Packages, Activities and Car-rental suppliers. 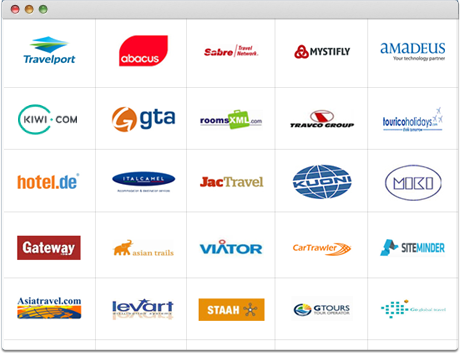 TravelCarma is connected to 85+ XML suppliers, including Amadeus, Sabre and Abacus for flights, Hotelspro, HotelBeds and GTA for hotels, Viator for activities, and CarTrawler for car rentals. 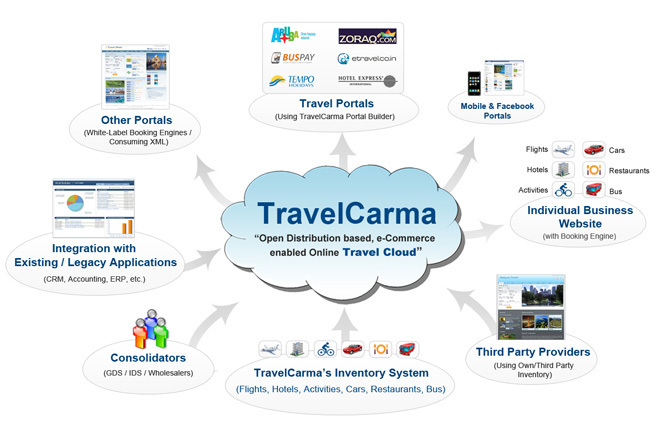 TravelCarma offers seamless integration with multiple suppliers with live feeds via a single XML interface. Our system allows you to initiate a single search against multiple GDSs and receive a single integrated response. 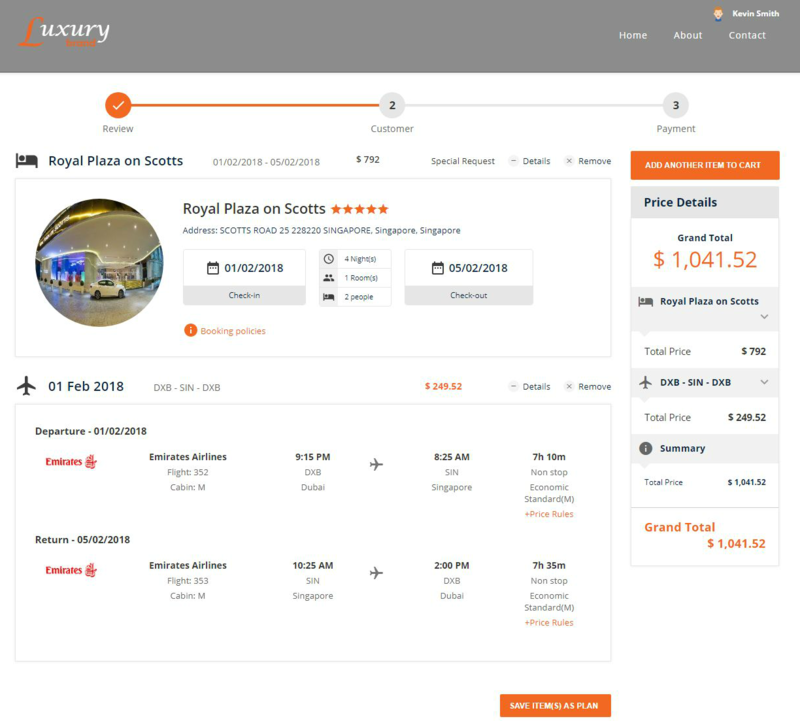 Helps you and your vendors manage your inventory of hotels, packages, transfers, activities and car rentals with pricing and availability from a central location. Easily set up business rules, policies, promotions and differential pricing based on season, customer class, nationality etc as well as stop sell and black out dates (for hotels). With TravelCarma you can allow your partners/suppliers to log in and update their inventory details themselves, thus saving you a lot of time and effort. Our system allows you to load your contracted rates with the hotels manually, but get the live rates through channel managers. This module allows your sub-agents to securely access your live inventories, make reservations and issue confirmations for their customers. It also helps you manage agent markups, margins, credit limits, commissions and other business rules. 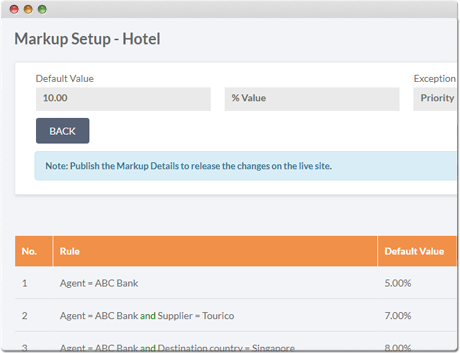 The Master Agent can add distributor and control Markup, Margin & Commission for the sub-agents. They can also dynamically establish business rules and set exception criteria for markup & margin to be applicable. Agents can set up commission for different businesses. You can view various dynamic details on the Dashboard, which can be filtered based on various criteria. Our system provides daily, weekly, monthly and annual sales and commission reports . 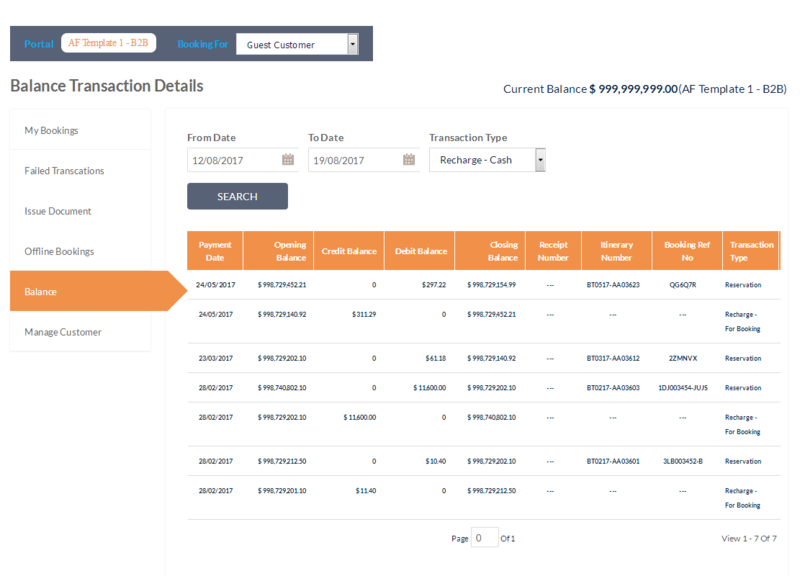 Agent transaction reports such as bookings, cancellations and promotional bookings and failed transactions are also available. The Master Agent can assign unique login credential to each of their downline agents, which gives them restricted access to only necessary details. Our Co-branding option lets your agents sell to their customers with their own branding and personalized email notifications. 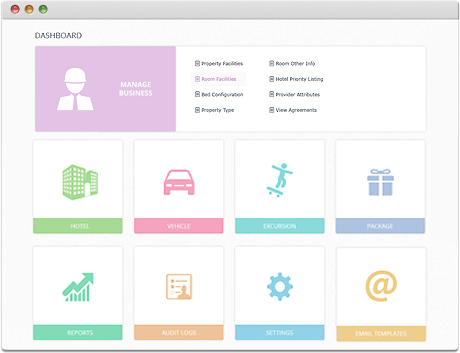 TravelCarma offers a number of other useful back-office modules including accounting, quotation management and group itinerary builder that improve efficiency and reduce manpower cost. 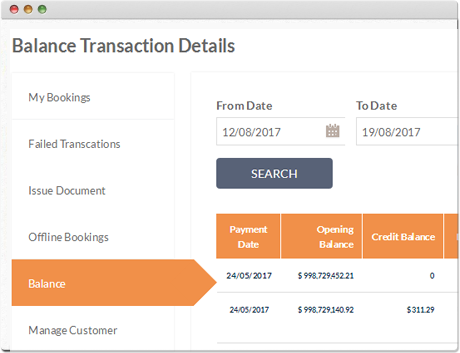 TravelCarma makes tracking of supplier costs, markups, agent wise prices, commissions, taxes for domestic and international transactions, as well as receivables and payables extremely easy and provides a variety of accounting reports to help you manage your business efficiently. Allows you to build and send complex multi-destination and multi-product quotations to your clients in a matter of minutes. 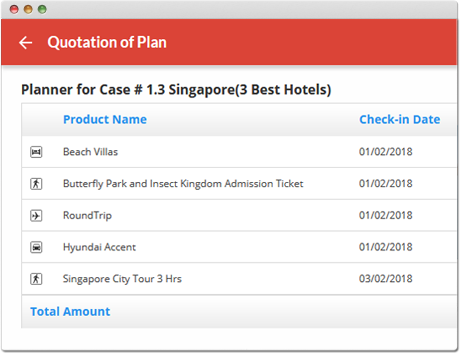 Your Agents/Employees can create custom tour packages with an option to add offline products. This helps you service 5 times more queries, reduces costs and increases your efficiency. Our Social planner module allows multiple co-travellers to plan, share and discuss multi destination itineraries together and make buying decisions collectively but pay individually. It saves a phenomenal amount of planning time and provides a great user experience. 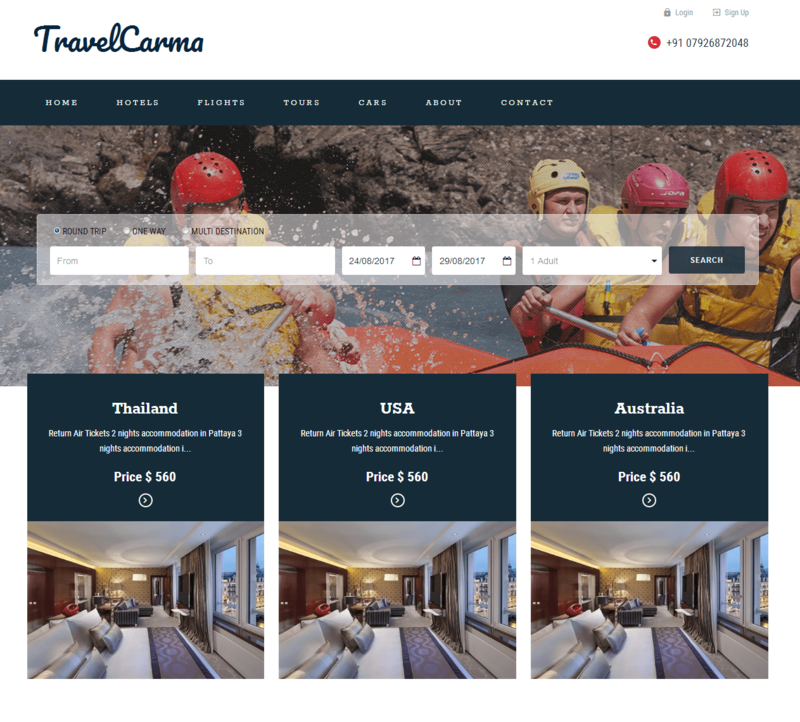 TravelCarma offers complete set of Internet Booking Engines for Travel Agents which allow your customers to book different travel products offered by you like, Hotels, Flights, Cars, Packages, Activities, Golf, Bus, Restaurants. 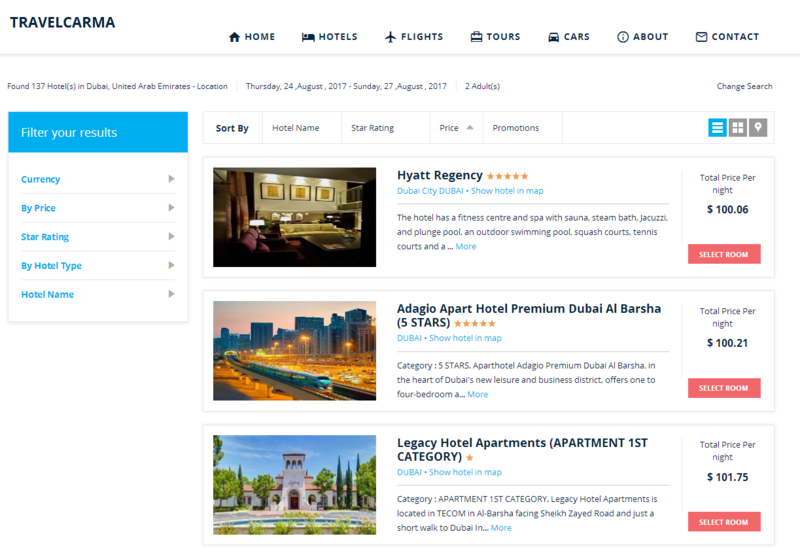 Our user-friendly booking engines helps your customers to easily search, check availability, compare, make booking and do payment online. 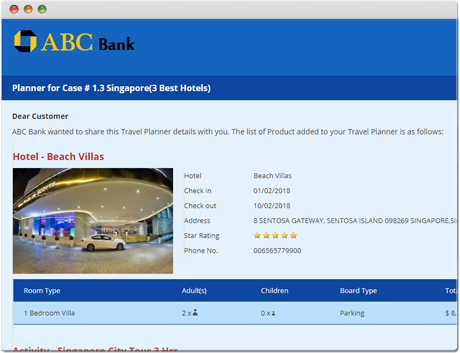 The interactive, intuitive and attractive design of the booking engines involves your customer into a buying experience which ensures that they easily complete the booking cycle till payment. It also allows you to cross-sell your other products/services. This increases the customer satisfaction as well as increases look-to-book ratio. 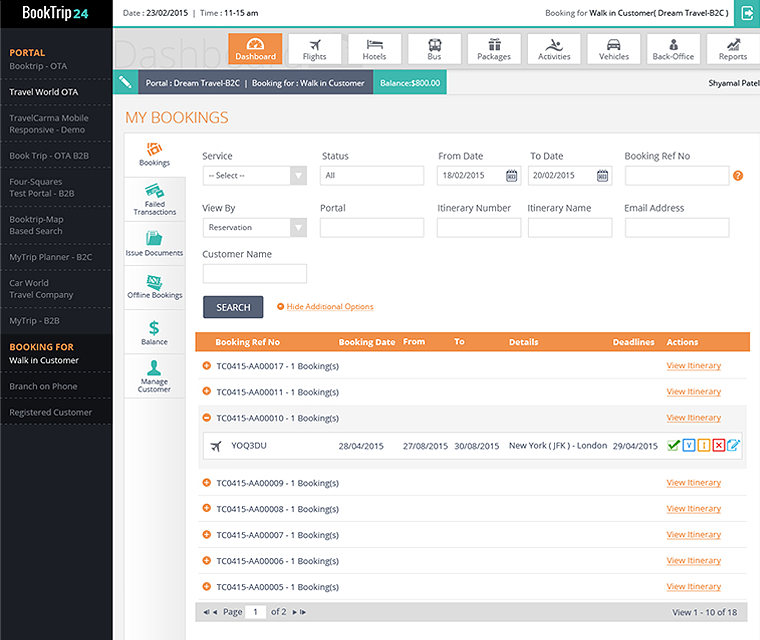 On technical front, our Booking Engines are developed using latest technology. Through our aggregation engine, it can be easily integrated with multiple suppliers of different travel products (GDS, Wholesalers, etc) as well as your own contracted inventory. It allows you to apply business rules at various stages. For B2B agency, our unique "Quotation Management system" increases the productivity of your employees/sub-agents by 300% and profitability by 200%. Booking Engines are also enabled for Social-Media as well as Mobile. 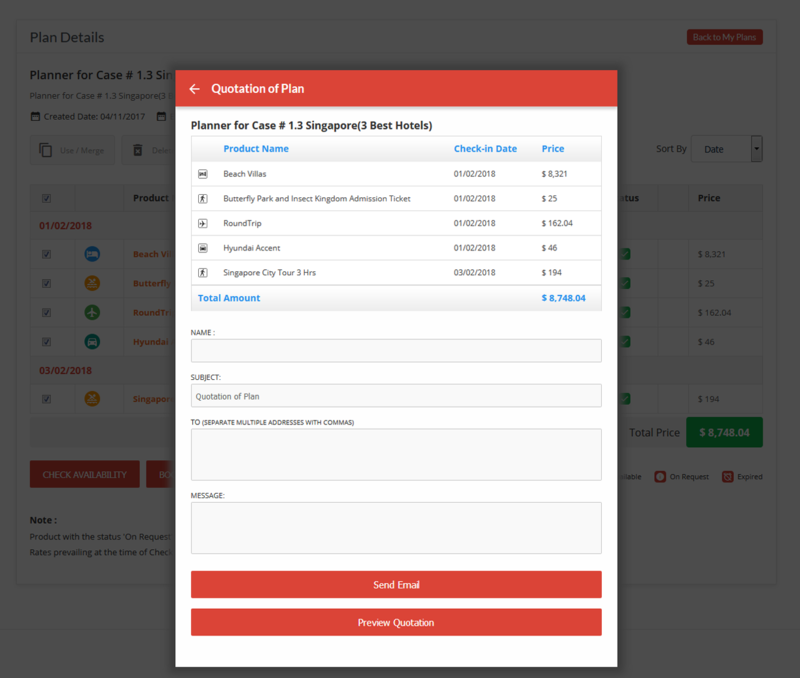 Add selected products to the Quotation and send it through email. 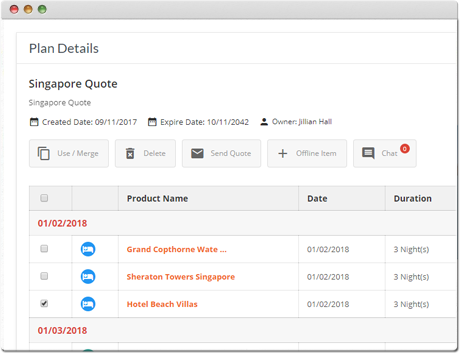 Quotation can be generated and send via email to multiple recipients. 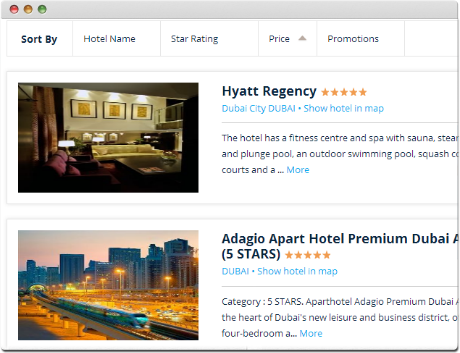 Booking engine can be easily integrated with other websites maintaining the same look and feel. It can also be integrated with any other third party suppliers. 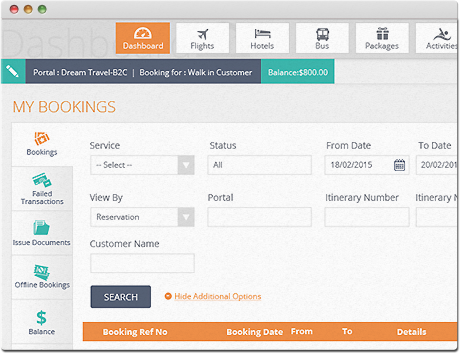 Booking Engine allows the Facebook users to book online on your portal. 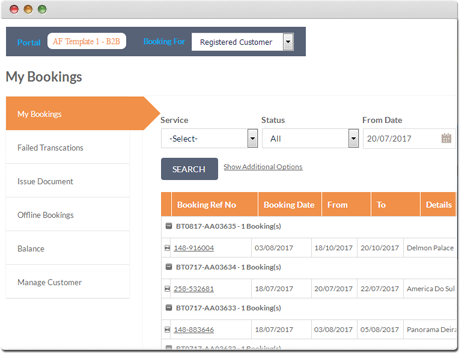 User can make online booking at the portal using the mobile interface application. 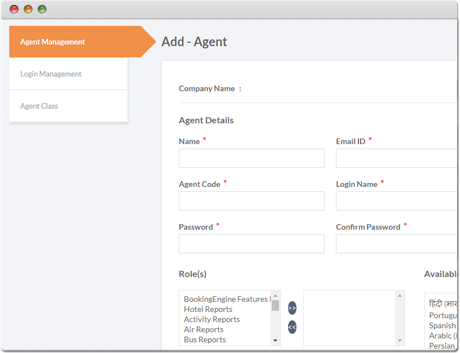 Set up account for different users like customers, agents and corporate users. 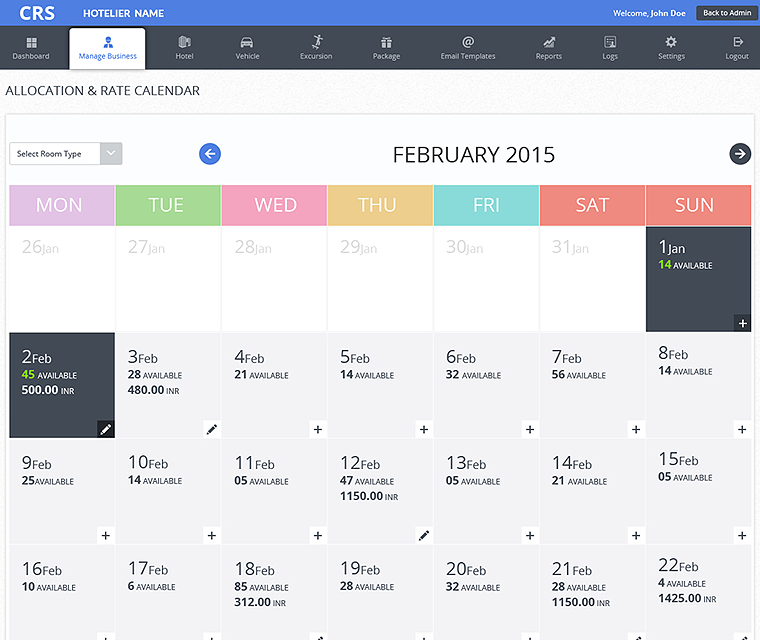 Booking Engine supports corporate booking (MICE) with discounted rates. TravelCarma's CRS allows a travel business to easily set up and manage complete details of all its suppliers and inventory of hotels, packages, excursions, transfers and car-rentals along with pricing. They can load the inventory for different businesses, such as hotels, activities, packages and vehicles into the CRS, along with availability and net rates. 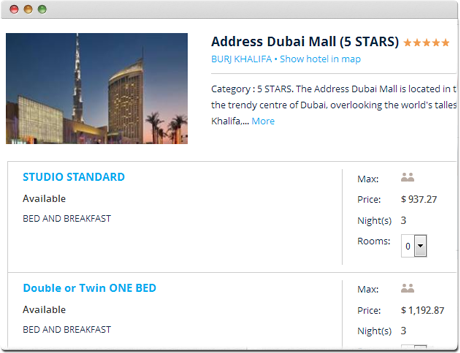 They can then add mark-ups and/or commissions to the net rates and control the price to be shown on the website when somebody makes a search using the booking engine. With TravelCarma, travel agencies can also allow vendors to access the CRS so that the vendors can directly manage their inventory, reducing the workload of the travel agent. They can also set up business rules, policies, promotions and differential pricing based on season, customer class etc as well as stop sell and black out dates(for hotels). TravelCarma's CRS makes it extremely easy for a travel business to manage its inventory and suppliers, and allows its customers and distributors to centrally access and book its inventory in real time. Create users at different level and define access rights at each user level. Information stored in CRS has a restricted access for users of the respective levels. Create users at operational levels who have rights to manage multiple businesses and inventory of subordinate user. 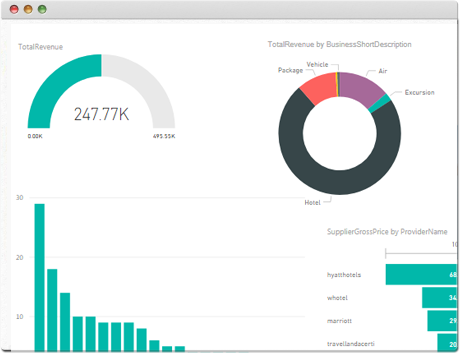 User can view various dynamic details on the Dashboard. Displayed details can be filtered based on some criteria. 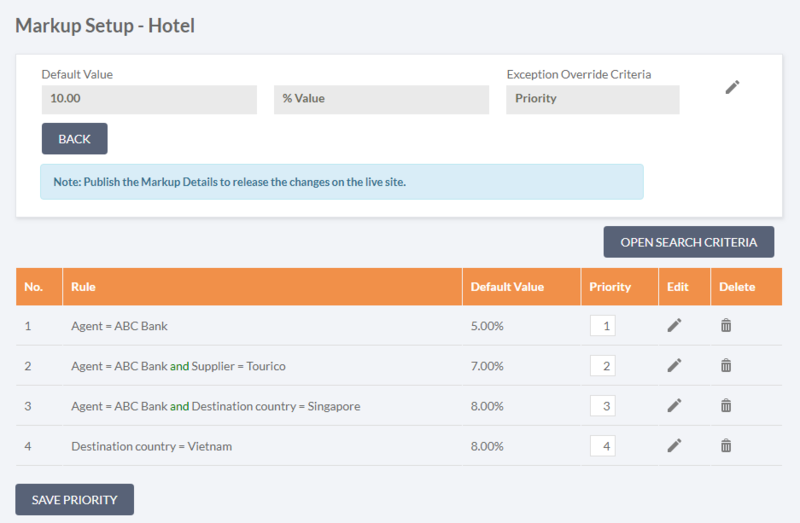 Define room rates based on nationality. Set up promotion/ offers for a specific period with exception criteria. 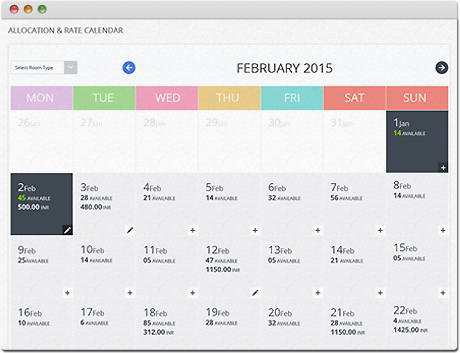 Set black out dates (stop sell) for an inventory to make it unavailable for online booking. 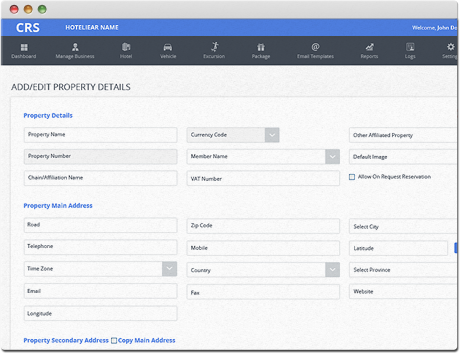 Set up different policies by providing their respective details and parameters. 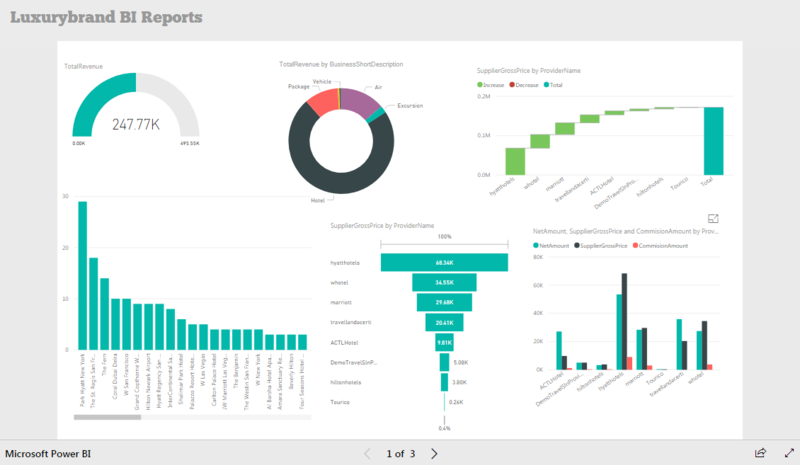 Comprehensive Report generation for various business objectives. Travel distribution is changing dynamically with suppliers trying to directly reach to either consumers or OTAs. With so many distribution channels available, it is a key to have efficient and effective Distribution Management strategy. There are a lot of complexities in the processes and business rules in managing commissions, rates, fees, etc. while distributing your inventory on different channels. Along with travel inventory, availability and rates, various metadata and optional services from the suppliers are also bundled in the travel product to sell. TravelCarma has addressed these challenges with its proven expertise in integration with GDS/IDS/OTAs and other Travel Distribution Systems for its clients. Integrations Expertise with Travel Distributors like HotelBeds, HotelsPro, GTA, Travco, Tourico, Hertz, Avis etc. Integrations with Internet Distribution Systems (IDS) and other Online Travel Agents. Expertise in sourcing/publishing, inventory and metadata information to/from different channels as well as alternate distribution sources. Channel Management, Commission Management, and Pricing Management. Fully web services driven, platform agnostic - connects to diverse platforms and data sources. Compatibility with Open Travel Alliance (OTA) standards. Sales Channel Management is agency solution for small-medium-big size agencies. 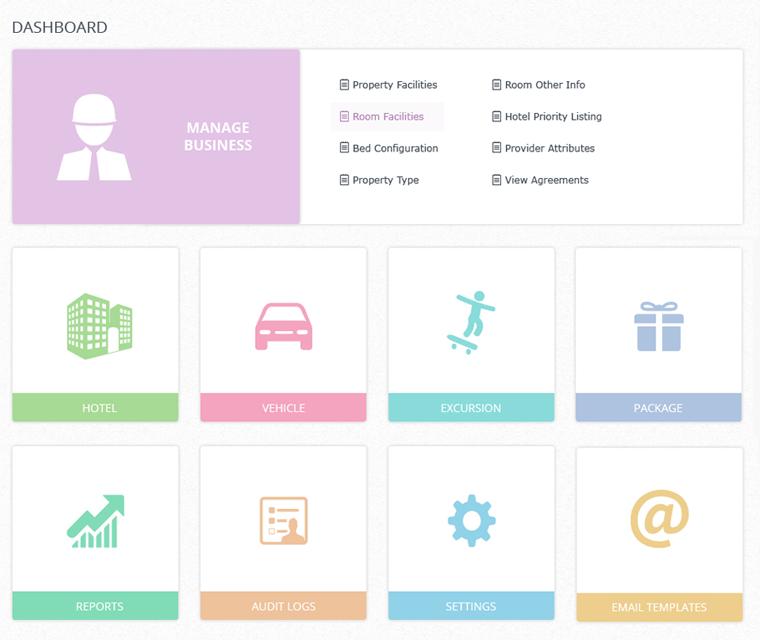 TravelCarma’s Sales Channel Management System is a hierarchical model for agents’ management. Associated travel agents do not need to manually maintain all their contracted rates and inventory. The latest update is available in the Travel agency system and can be viewed by any designated reservation staff, at any time, in real-time manner (online). Sales Channel Management allows managing Agents, Sub-Agents for all hierarchy. Online Sales Channel Management allows managing commissions percentages for each agents and sub-agents. Each travel agent can be assigned a username and password to access their contracted rates/discounts directly from travel agent system. User Management for different users of the system like agents, sub-agents, employees, corporate users. Configure Co-branding system for each user with rich look and feel interface. Master Agent can add Distributor and set Markup, Margin & Commission for the down line sub agents etc. Dynamically establish business rules and set exception criteria for markup & margin to be applicable. Agent can set up commission for different businesses. Master Agent can assign unique login credential to each of his downline members, which gives them restricted access to only required details. Achieve data security & confidentiality by allowing access of specified features to designated users based on his/her Authority level. Generate frequently used reports like agent commission and various dynamic reports, which would help in making business decision. Master Agent can manage contract between sub-agents with different providers and services available for them. Create different policies and set authorization level for taking policy approval. Block and released members for required period as per the business needs. User can send an Alert or notification through Email/SMS when balance amount of agent reduces for making a booking. Having an Online Travel Portal and updating it regularly is mandatory to survive and grow in the dynamic highly competitive environment of the Travel & Hospitality Industry. But it is very expensive and time consuming for creating, hosting, maintaining and updating such portal. Also, it requires technical skills and has dependency on web-masters. TravelCarma addresses these challenges by offering a solution which helps you to drastically reduce the cost, time and effort of creating, maintaining and updating your Online Travel Portal. Our solution is very easy to use and you can yourself update/manage your website without any technical skills or dependency on web-masters. Our solution is Content Management System (CMS) based which facilitates managing content as well as gives you full independent control of your website/portal. Moreover, you can also offer a website to your down-line agents (B2B2C) with your own booking engine (white-label).The solution is SEO (Search Engine Optimization) friendly and social media enabled, which ensures that you have more visitors and better look-to-book ratio. 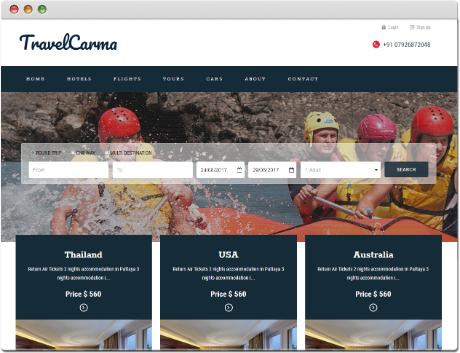 We have already designed multiple website templates (layouts / designs) to choose for your portal (http://templates.travelcarma.com). Our readymade templates enable to quickly launch your portal. If you need a customized template (design) as per your choice/branding, our team of designers and Usability Analysts can help. Or if you already have your design ready, we can easily integrate it with our CMS. Travel Agents can manage web content in WYSIWYG editor. Add/edit webpage content, upload images, PDF files etc. Travel Agents can maintain the website themselves to avoid web maintenance expenditure. Without any programming user can do modifications like new content updations or new page addition. User can organize the web pages in hierarchical and sequential order and set link on each page for redirection to the same. Travel Agent can manage Advertisement, Newsletter, Testimonial, Press Release and FAQs displayed on the site. Manage various module level settings related to the records and user type. Capture the customer’s details for email campaign. Share website content with other websites and applications. Host the same content for multiple domains. Create search engine friendly page with potential content to get easily optimized for search engine. Travel Agent can create Tag Cloud and manage hyperlinks at each tag. Site visitor can post their review for Deals/offer on the Social Media websites like Facebook. Site visitor can follow Travel Portal profile at the Social Media website – Twitter to get updates. User can also login into the system with his/her Facebook account details. 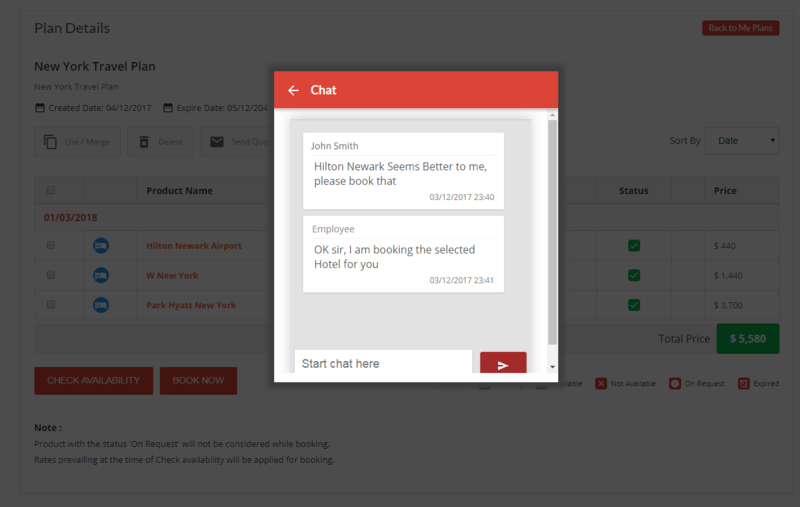 Easy integration with booking engines and social networking modules. Online Travel Portal based on Content Management System (CMS) gives you full control on your website and content. A frequently updated website attracts importance and higher page ranks by Search Engines. Our CMS allows you to leverage this benefit by easily update your website regularly. 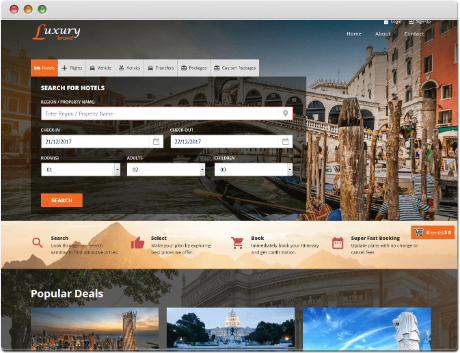 Travel Agent can not only load his own supplier content including data and images, but can also manage general content such as destinations, specials/hot deals, user defined pages and much more. You can easily control your website(s) content without the need of an expensive web designer which reduces the business cost. Multi Language Support helping Travel Agents target their specific destinations with that particular language. 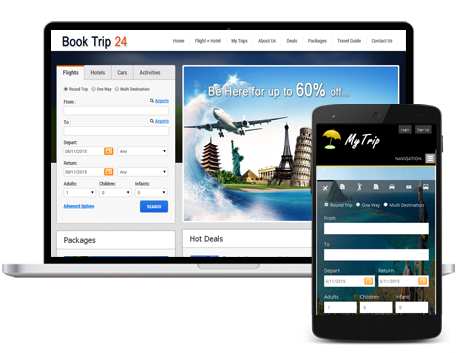 TravelCarma offers high end XML API web services solutions for travel agents. 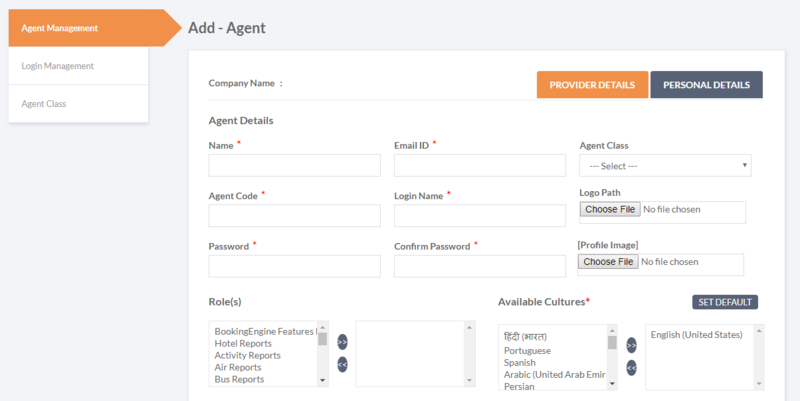 Travel Agent XML API will create gateway for you and connect your agents directly to you resource. 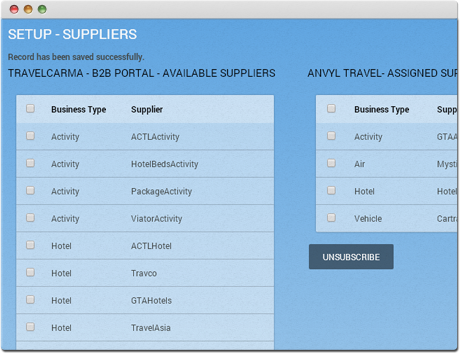 Travel Agent XML API enables access to your resources and extends you agent range. 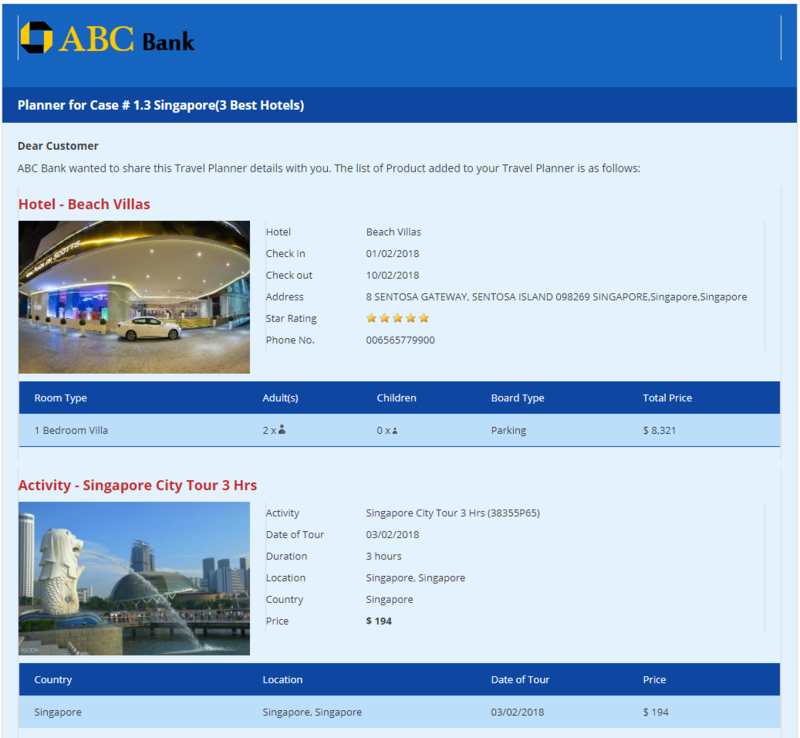 Travel Agent XML API built on the concept of an Enterprise Service Bus (ESB) is scalable. 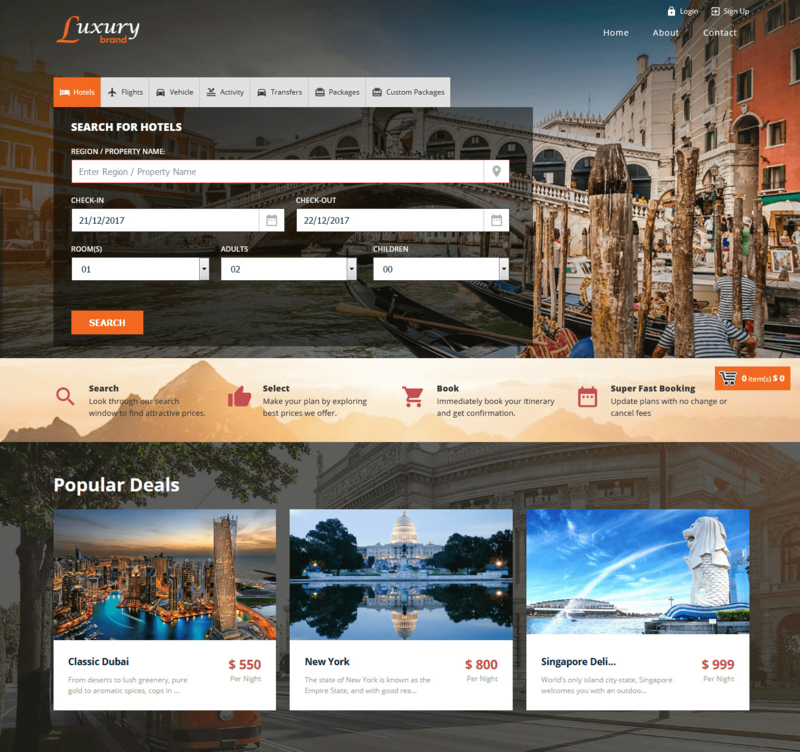 Easily configurable architecture of Travel Supplier Connectivity is based on XML and SOA (Service Oriented Architecture). 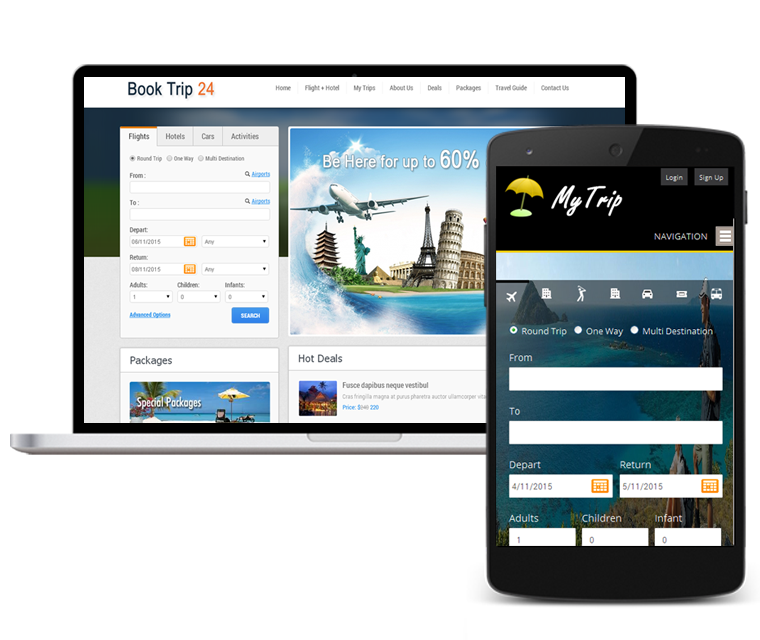 XML API allows travel agents with proprietary or third-party booking platform to integrate and build highly customizable booking interface. It is able to query multi-GDS contents sourcing into singularly unified booking interface. 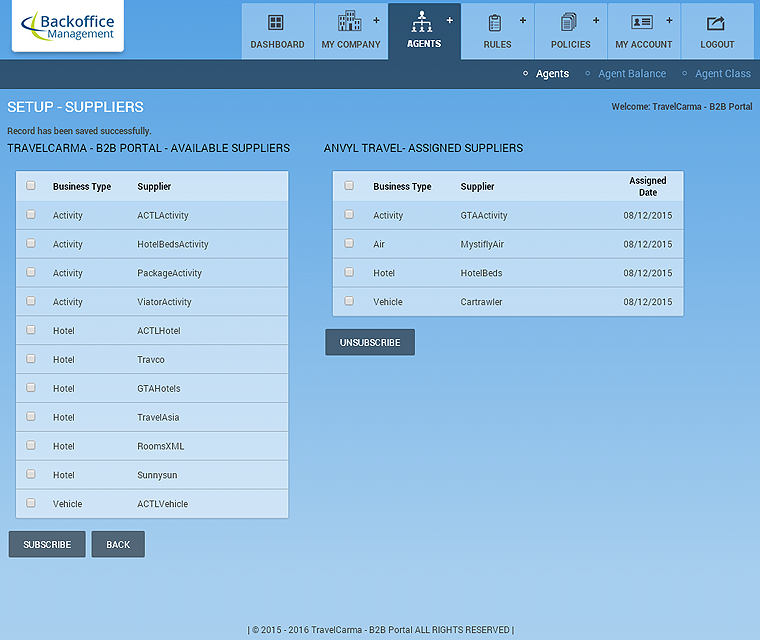 Supply inventory from CRS as OTA (OpenTravel™ Alliance) compliant xml web services in a cost effective and secure manner.